In this episode, Keven catches up with Kelly Croy. Kelly is an educator, author, artist and speaker. He currently serves as the Director of Innovation and Instruction at Port Clinton City Schools. Over his 28 years in education, Kelly has had a major impact on many students lives and helped to motivate teachers through podcasting, motivational speaking, and is a proven leader. Kelly is the host of the Wired Educator Podcast, the Future Focused Podcast, author of "Along Came a Leader" and the soon-to-be-published "Unthink Before Bed". In this episode, Keven talks about the sessions, ideas, and tools he encountered at the Ohio Educational Technology Conference in Columbus, Ohio. There is a focus on esports, a variety of tools that were highlighted in sessions, and a dive into the Pear Deck Google Slides add-on. View notes from #OETC19 attendees for nearly 100 of the sessions by clicking here. In this episode, Keven discusses a wide variety of topics and the amazing things that happen in Leah LaCrosse's classroom. PBL, iPads, Chromebooks, 3D printing, and more! In this episode, Keven discusses some of the differences between small school and big schools with Cari White, Director of Campus Ministry at Lakewood St. Edward's High School. Cari also talks about many of the great things going on at St. Ed's and what it is like working in a single gender school. In this episode, Keven discusses Digital Discipleship, the Future of Education Technology Conference and the National Catholic Educator's Association Conference. In this episode, Keven discusses inclusion and the Twitter Impact on educators with Doreen Engel (@engelworks). They also discuss Doreen's upcoming book, Be Open! In this episode, Keven discusses inclusion with Denise Brickler as well as the NCEA Social Media Influencer Contest. In this episode, Keven discusses the impact of Twitter on teachers with @BarbInNebraska. In this episode, Keven discusses the importance of trying new things in the classroom. Episode 010: Tools to Kick Off The New School Year! In this episode, Keven discusses the importance of entertainment and the impact it can have on your lessons. In this episode Keven talks about taking ownership for the good and the bad and what it means for culture in your classroom. 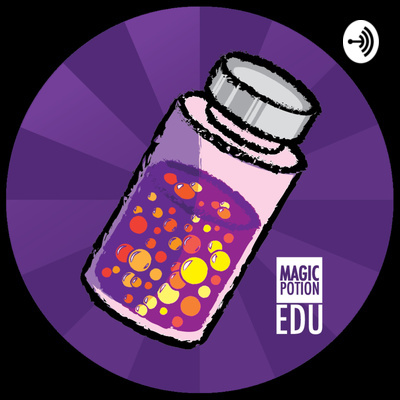 In this episode Keven discusses the “G” in the MAGIC Potion formula, Get Out There! Find what you are lookin for on Twitter and attend conferences that interest you. In this episode we discuss the idea of being grateful. Let those around you know that you appreciate them and highlight outstanding work, letting others know you are proud of them! In this episode we take a look at what to do when things don’t go as planned! Episode 003: PD - Make It Yours! In this episode, we talk about making professional development your own. Make the best out of every situation and presentation you sit in, amplify your own presentations, find your passion, and get on Twitter! In this episode we take a look at motivation, for students and teachers!